Templatehack.com - Download Invert premium blogger template. Hello again guys. 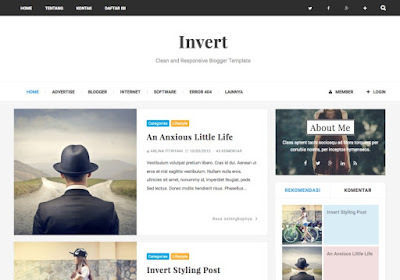 Today I will share on of best blogger com template, it is Invert blogger templates. This theme designed for entertainment blogger templates, which has a simple and unique design like wordpress. I will share this blogger template for free and you can download with the link bellow. This is free blogger template 2019, enjoy it and install on your blogger.